After two days of exploring Mahe Island, I am thoroughly impressed with the incredible natural beauty of the island. The granite walls, studded with palm trees, with peaks into the clouds are visible at every turn. The beaches are from fairy tales, and the water colors are amazing. The granite boulders in the surf are smooth and easy to climb on, and make a nice place for a nap in the sun. I do have a little sunburn. I have been watching the storm south of the Seychelles on satellite, and listening to the rain pour off my roof. I wake up for my flight, no sound of rain, and a check of the satellite shows two arms of the tropic cyclone, with Mahe in the clear between. Lucky me. I planned on a 0600 local departure, and go the airport, taking off with a nearly full load of fuel for Colombo. The air traffic controller there, Colin, came to say goodbye and see me off, which was very nice. I would reply “Hi, N30EW with position report” “OK, go ahead” “Position X time Y, next Z” OK, Thanks” “Bye Bye’ “Bye.” Strange amalgam of radio and telephone, but it worked. I realize I have been lucky using the phone, it is likely I would be held back with a negative HF check on these kinds of over water distances. I make some calls to try to set up repairs in Singapore, and hope I can make it there. The HF is one of a few things I have no back up for, unless the phone counts. 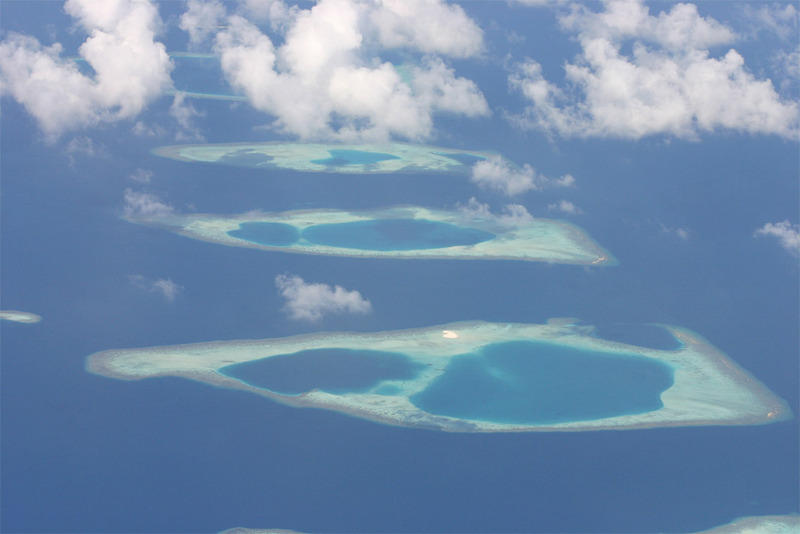 Later I see the first atolls of the Maldives, and am awed by the spectacle of colors and islands stretching off to the horizon. I fly over Male, which has an island airport, with the island nearby communicating by ferry and water taxi. 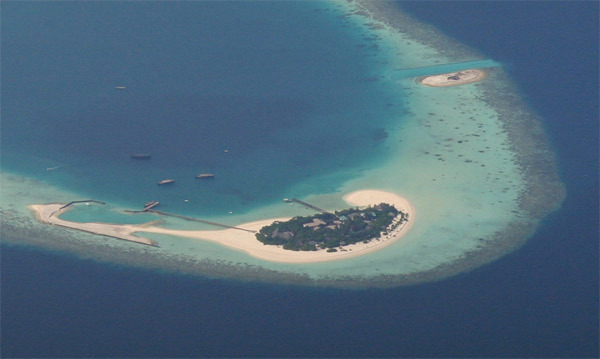 I was interested in going to the Maldives, but avgas is taboo, no leaded fuels allowed in the Maldives. 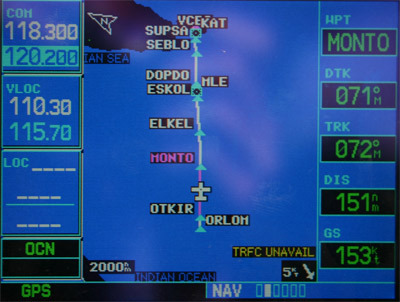 I want a picture of Male, but it is hard to take pictures of points directly below while on an IFR flight plan. I sort of manage. 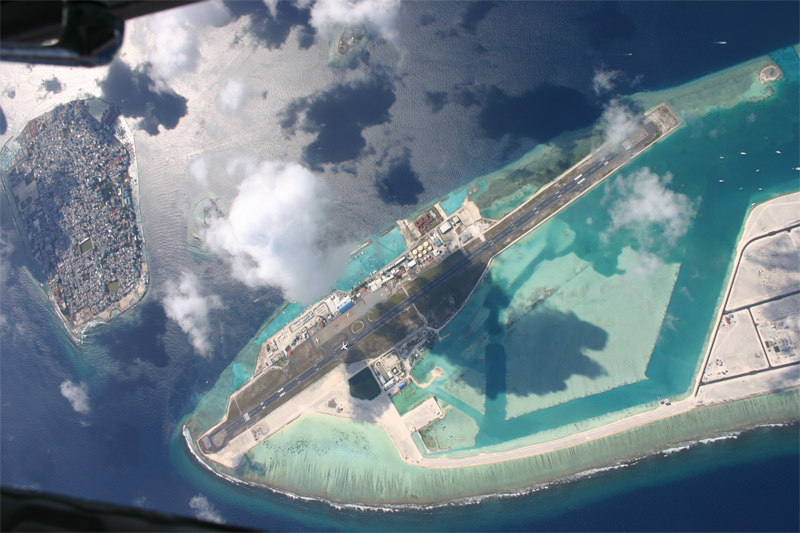 Male Airport- the only thing on the island. 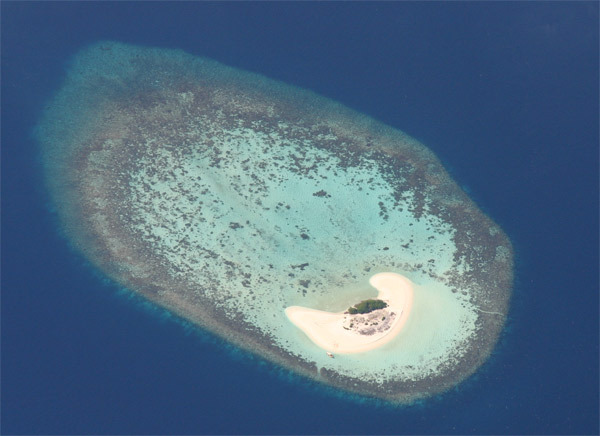 People live on next island over. Soon the Maldives are behind, and the sun is getting lower, my ETA is 20 minutes after sunset. I have been listening to the radio to see what types of approaches are handed out and what pilots request. Each area I have been to has very different ways of accomplishing common goals, different language and ways of using instrument approaches. One guy asks for direct to 6 DME final for ILS 04, and it seems like a good plan. The setting sun and haze make visibility nil ahead, but I roll out onto the pretty pink final course, and see the ILS lights ahead. Easy landing after 10:40, but I have only seen about an acre of Sri Lanka. The tower directs me to parking, where I am met by my handlers. We chock the plane, call for the gas truck, and I start pulling off the rear bulkhead, behind which lies the HF amplifier and antenna tuner. I am quite lucky, the problem is obvious. The amplifier cable has broken where it attaches to the bottom of the antenna. Seeing is easier than getting at, but after some contortions, and the help of the handlers on the outside giving me tools, I get the lead reattached with figures of eight of some spare wire, a little duct tape, and a wrench. I check it on the ground, I can hear people, but no reply. The gas truck arrives with two barrels of 100LL, we open them, and fuel up. I take two barrels (only unit available is “a barrel”), 100 gallons total, added to my 95 remaining. I reassemble the plane, and go to the terminal to pay.for gas. I’m off to my hotel, I have chosen one far from the airport, but am rewarded with an excellent Indian dinner in my room. The adrenaline from the flight wears off, and I am really tired, off to sleep about midnight.